Manyyears ago wires between door and frame frayed from opening and closing.Repaired and window worked fine. Later replaced motor that I found out was bad,not rail it rides on by checking voltage to motor. Worked fine. Nowwindow stuck in closed position. Checked continuity on wires with probe. OK.There was only one wire had no conductivity blue wire from switch. No breaks init. Voltage going to switch but not motor.Measured voltage at switch connector reconnected and then measured voltage atmotor nothing. Replacedswitch but works but a lot better but a little intermittantly. Does not work atdrivers side. 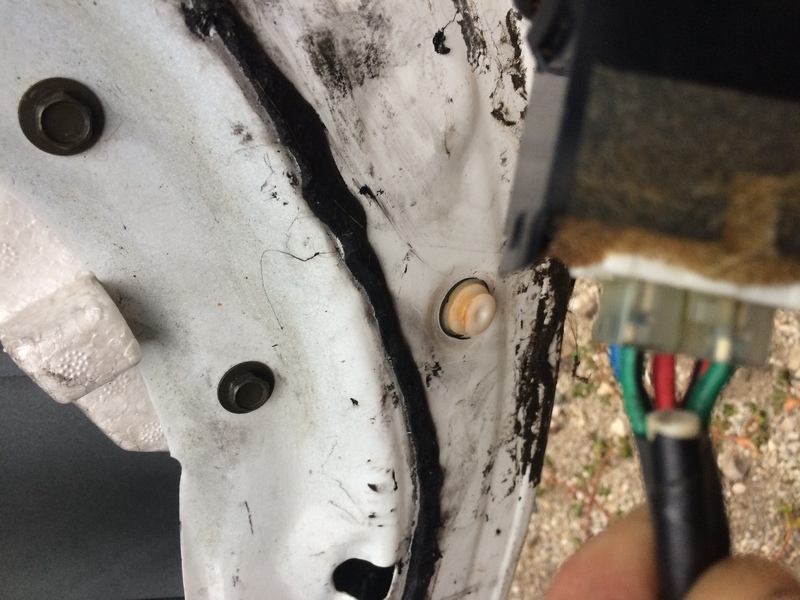 Old switch was very worn and cover cracked. I think it’s the connector to the switch oris there a procedure out there to follow. Does the switch on the RR door work? You stated the switch at the passengers door does not work for this window? I pasted the info from a word doc. I was writing so all info was not included . Sorry. The right rear door switch ( just bought) opens and closes the window. The other one did not work at all and was cracked. Now once in a while the new switch will not work. All other door windows work. The drivers main switch does not bring the RR window open or closed. Maybe its the connector to the switch. What I wanted to note that when I took off the skin I could see a water line on the inside so this door saw some water. The other skins do not show this since I have worked on other doors. The drivers door main switches for the windows route its power to the passenger window motors through the appropriate passenger door switch. The driver door switch movement changes voltage polarity at the motor to change motor direction. Wire colors at the RR door switch are green/black and red/black. 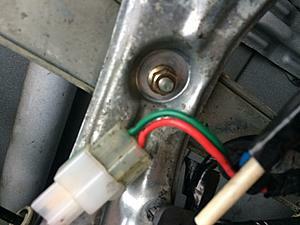 Check for proper 12v +/- changes at the passenger door switch with operation of the appropriate drivers door switch. Then check if these changes are showing up at the motor. The passenger door switches work differently then the drivers main door switches. The blue wire supplies 12v + power to the passenger switches. The passenger switch operation then routes this power to one or the other wire of the motor to power it CW or CCW. 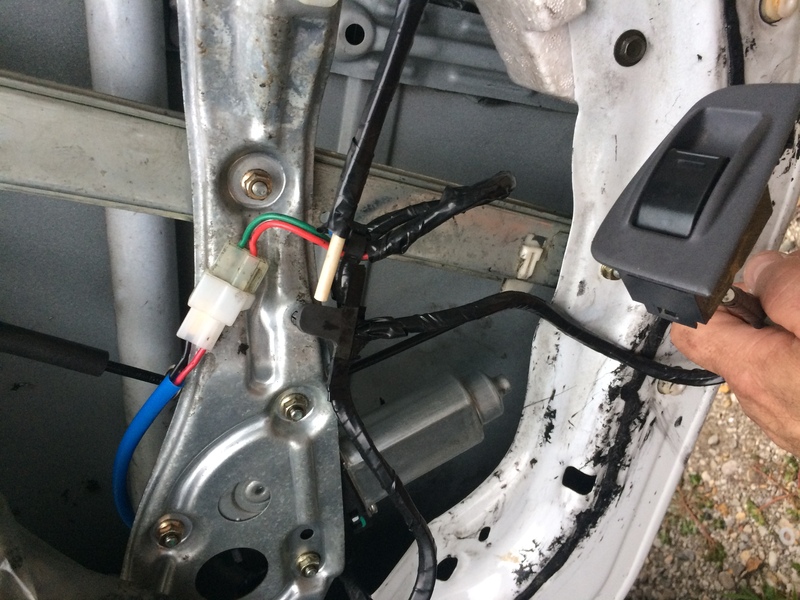 The passenger switch then also routes the return power (negative) back via one of the other wires coming from the drivers door switch. This wiring allows the individual switches to work independent of the drivers door switch. The connection to the switch is the issue . I checked using kleins low voltage meter and volt meter. 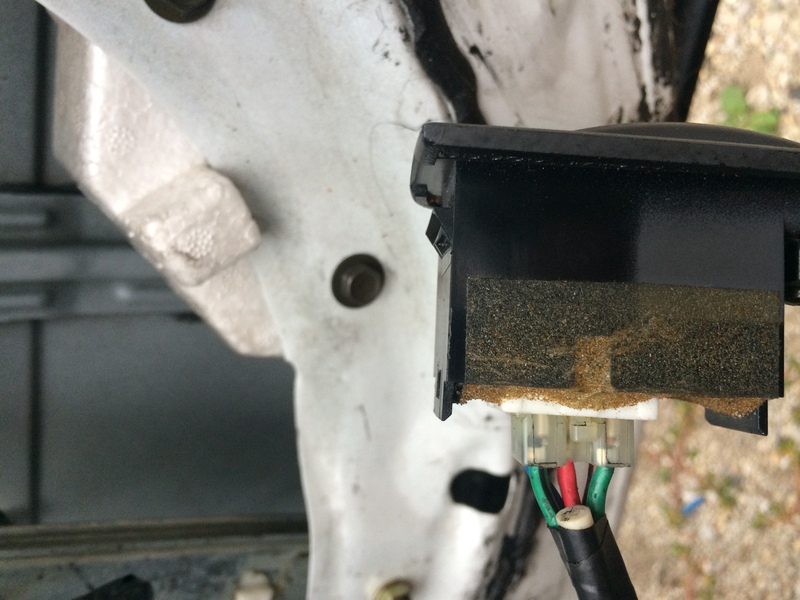 As you go up 12 v and down 12 v. Jiggle the switch and window stops plus connection is loose. There is a hot wire going into female switch connection which is 12 v blue and solid when jiggling wires but once connected female to male switch its loose. 12 v from drivers is intermittent at switch and motor. If switch does not move its good. Getting a new switch definitely improved it. blue - This supplies 12 v as you said and is solid. The wires and their connectors can be removed from the plug. They are each held in with a built-in spring tang. The connectors can then be cleaned, straightened, crimped slightly to improve their connection and grip. Check the pins in the switch to determine if they are loose. Thanks for the feedback. Will keep you posted. Good to check pins. Checked and were not loose. The right rear window works from the driver and passenger side. I inserted a tiny screw driver inside the female end to unhook the metal connector and pulled on the wire on the opposite end. Once out crimped it a little to tighten it up. Did to the remaining connectors/wires. All female fittings tight. I am now off to figure out why left rear door lock does not work. Its the only electrical thing to fix on doors. Tested continuity at the plug to doo lock and one of the two wires had no continuity. No continuity where door wire goes through door through the flexible rubber hose like thing. Will chase down further. Thanks for your help. 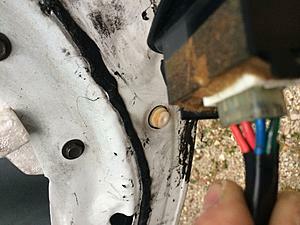 The left rear door wire for the door actuator was broken and other wires frayed. Soldered them all. Used A Weller 140 watts for the 12 gauge wire. The small low wattage solderer does not heat up well (40 watts). I just received new drivers, passenger, ignition and trunk locks for replacement and finishing that up. Generally, my locks are the original and in poor shape. Got them off ebay, from a locksmith and were in very good shape and rekeyed. One last door to do. If you are doing this I can help with questions. It's not easy but not too hard. Thanks for posting back with the results.